Who would've thought that you can start a raging fire using the Nutella chocolate spread sprinkled with the inorganic chemical compound potassium permanganate. 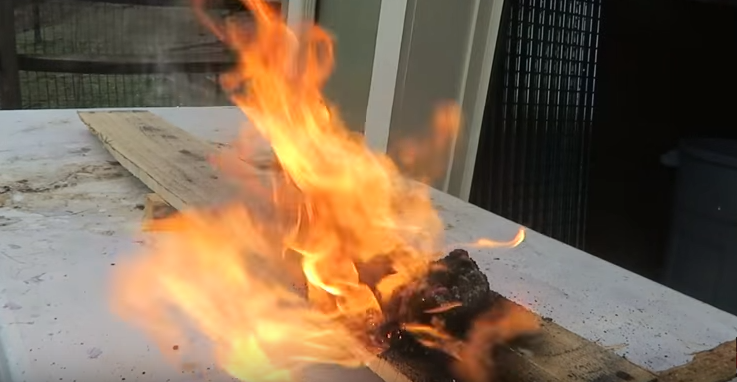 As demonstrated by the Russian YouTuber who goes by the username CrazyRussianHacker in a recent video, a combination of the two makes for an easy and very combustible firestarter. You don't need anything else, just the Nutella, potassium permanganate, a beaker or any container to mix the two, and a lighter or box of matches to lit the mix on fire. 1) Get some Nutella spread and put them inside a beaker or any plastic container. 2) Pour some potassium permanganate into the beaker and mix the two ingredients thoroughly. The resulting mix or paste should be dark in color. Darker than the brown color of the Nutella spread. 3) Place the paste on a pile of firewood where you want to start the fire. Then light it up. Make sure to distance your hands away from the paste after lighting it up because the fire can spread quickly. It can also shoot flames up to a foot long so move away. It's common knowledge among survivalists that potassium permanganate is reliable when it comes to making fires. It's typically included in survival kits. The chemical is well-known within survivalist circles because of its many uses. It can be used to purify water, create an antiseptic solution, treat fungal inspections in the hands or feet, disinfect cholera, treat canker sores, mark snow as an emergency signal, and disinfect. It has also been demonstrated a long time ago by Les Stroud in his show Survivor Man that potassium permanganate combined with glycerin is a good chemical firestarter. However, this is the first time we've seen someone use Nutella and potassium permanganate to create fire. So what's the ratio between Nutella and potassium permanganate in order to make a firestarter paste? CrazyRussianHacker didn't elaborate in his video but looking at the mixture he made, it's probably about a 4:1 mix ratio. Making a firestarter from Nutella chocolate spread makes for a good home or school experiment. But as we mentioned earlier, you have to always keep your distance when lighting up the paste because the mix is very combustible. Watch the demonstration by CrazyRussianHacker in the very informative video below.